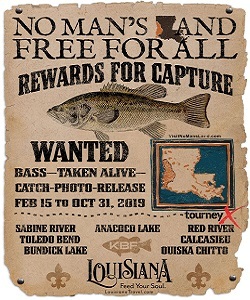 No Man's Land Free for All Tournament encourages anglers to explore No Man's Land area's lakes, bayous and rivers; to catch largemouth bass and upload their digital photos in competition for cash prizes and awards. Judges will check the photos, verify the scores, and declare winners based on the length of each competitor's bass. Competitors agree to abide by Event Rules, Terms and Conditions. This competition will be great for ALL! a. This is a Catch-Photo-Release tournament for largemouth bass caught in public waters only; fish are not required to be retained by competitors but may be released after photographs are taken. b. Restricted areas designated “Private,” “No Trespass,” or with similar postings are out-of-bounds; fish caught in those areas are ineligible to be submitted for competition. c. Scoring of photographed bass is based on fish length, not on weight, in quarter-inch increments. d. The smallest length bass that may be submitted for scoring is 14.00”. Photos of bass shorter than the minimum will be denied. If deductions reduce a photo’s score to less than 14.00”, that photo will be denied. e. A competitor’s score is the sum of the lengths of his five (5) longest bass (highest-scoring photos) caught from eligible water during competition. f. KBF Big Bass Side Pot is $25 for the entire season. Awards for biggest (highest scoring photo) each week ($100), month ($500), and event ($1,000). b. Photo submission deadline is 11:59 p.m. on October 31, 2019.
c. Fish must be caught and photos uploaded during competition period. a. Method — fishing is permitted from bank, dock, pier, shore, or while wading, or from any floating platform or watercraft. No restrictions regarding propulsion, size, or configuration. b. Tactic — Fish must be caught using rod and reel with artificial. No trot-lines, branch lines, jug fishing, noodling, gill-netting, etc. Only one rod may be in use at a time. d. Cooperation — Each competitor must position himself, make the cast, move and retrieve the lure, set the hook, reel in the fish, and land it without assistance from another person. b. Fish must lie centered on the measuring board with its mouth touching the “fence” (a.k.a. “bump”; upright end of the board), left eye upward and right eye against the measuring board. d. No straps, clips or other restraining device may be used to secure bass to measuring board. e. Hook/lure may remain attached in photo but line must be relaxed and not used as a restraint. f. Mouth may be open or closed; no penalty for mouth position. g. Length is determined by the longest point at which the tail tip touches the measuring board, or if the tail tip extends off the measuring board, the farthest point at which the touches the measuring board. If that point is between two quarter-inch marks, measurement is rounded down to the lower quarter inch. h. Bass tail must be fully in contact with the measuring board. If bass’ lifts its tail fin off the measuring board, photo will be denied. i. Photo must be taken with a smart phone or other digital camera that can be used to upload the digital photographs through the TourneyX App or Website. j. Event ID Card with the Competitor’s name and unique Angler Event ID Code must be in the photo, legible, and positioned above, below, or beside (not on) the bass. a. If fishing from a boat, competitor must comply with all USCG, state and local regulations regarding lighting, signal devices, life jackets and flotation. b. Competitors in watercraft (kayaks, canoes, SUPs, pirogues, jon boats, pontoon boats, bass boats, etc.) must wear properly-sized and fastened USGC-approved personal flotation device (PFD, i.e., lifejacket) during competition.